I love books as much as I love veggies (well…certain veggies). 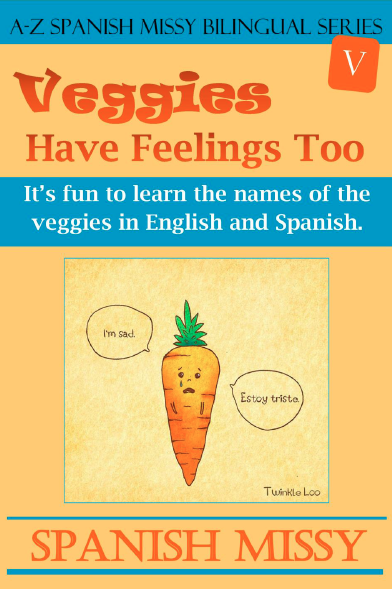 So, when I was presented with the opportunity to review a book that teaches children about veggies IN SPANISH…I was sold. The story of Veggies Have Feeling Too is too cute to miss. Besides the adorable illustrations, great vocabulary and sweet story line, this book includes a series of questions that will engage both you and your child (children) to talk more. Melissa Herrera (aka Spanish Missy) is the ‘brain’ behind the series which includes The Number’s Day at the Park, The Little White Ball and His Big Idea, and Maddy’s First Week at School. However, this book review would not be complete without giving you the opportunity to win some e-books. All you have to do is follow the instructions below for the giveaway. Good luck to all of you and remember to keep on reading.